Who doesn’t love the taste of food cooked on open flames? Food cooked on open flames is not only tasty but outdoor cooking, whether during a campfire or BBQ session provides an opportunity for friends and family to gather and relax. Well, you can get the same experience while cooking with a fire pit is just as easily. 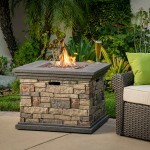 However, when it comes to outdoor cooking on a fire pit, not all fire pits can be used for cooking. 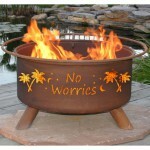 Wood burning fire pit are the most ideal for cooking. 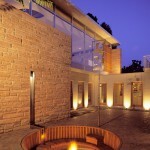 Some gas fire pits can be used for simple cooking, such as roasting marshmallows but generally, gas fire pits are used to provide warmth and not for cooking. 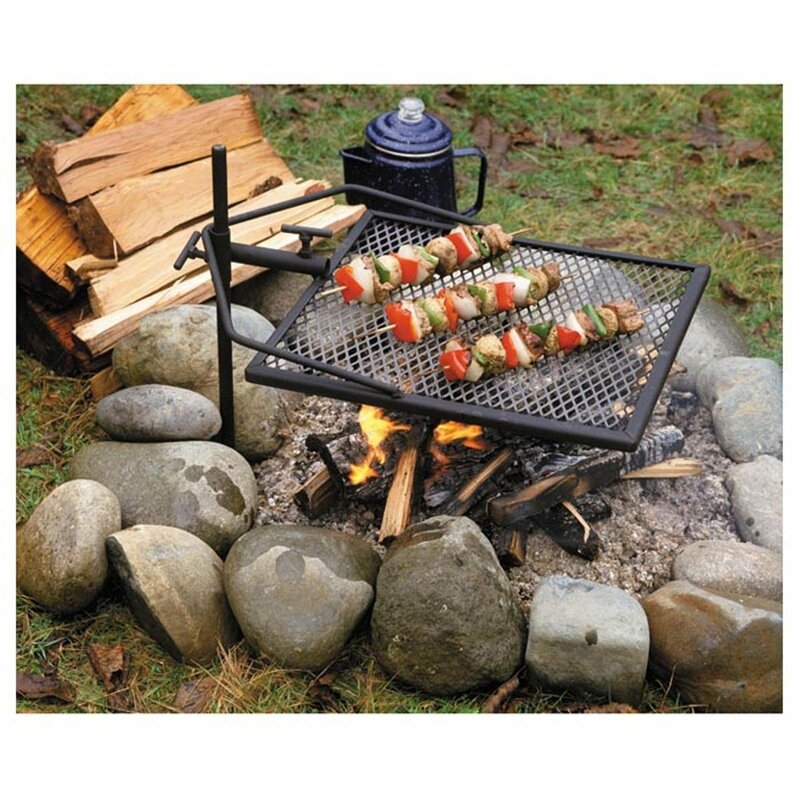 Cooking on a fire pit is quite easy, as long as you have the right fire pit cooking accessories. 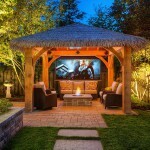 Let’s take a look at these fire pit accessories below. 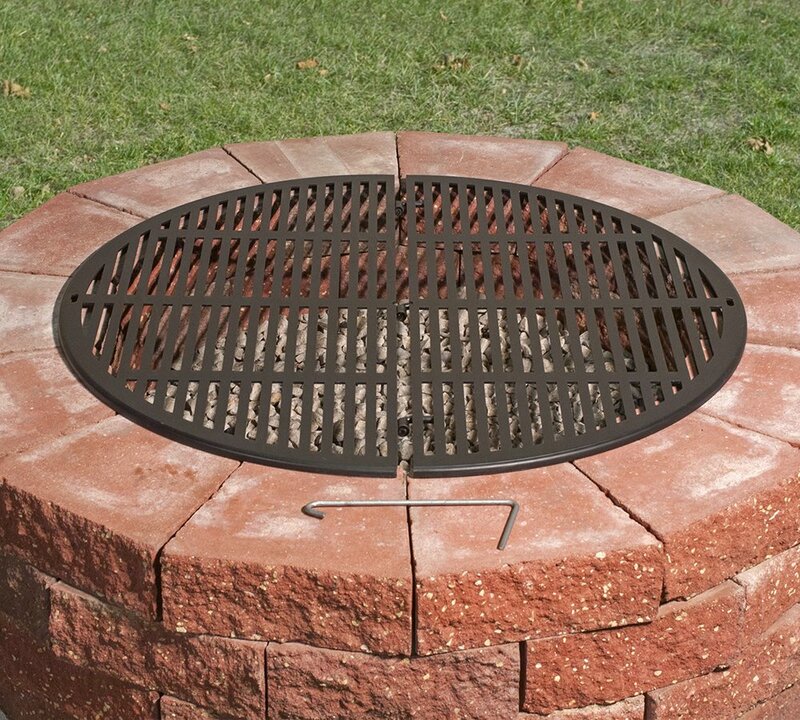 Fire pit grates are accessories used to keep logs off the bottom of the pit thereby facilitating airflow in the fire pit which in turn ensures consistent fires and better flames. 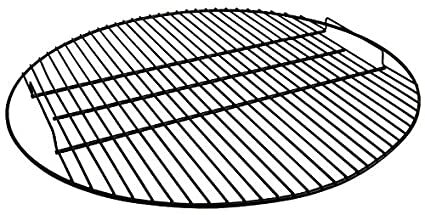 Fire pit grates can also double up as cooking grills by providing a surface on which you can place your pan, griddle and other cooking accessories. 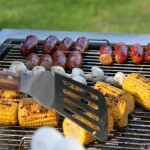 Grates are great for holding wood cooking on them but is not recommended to place food directly on them. 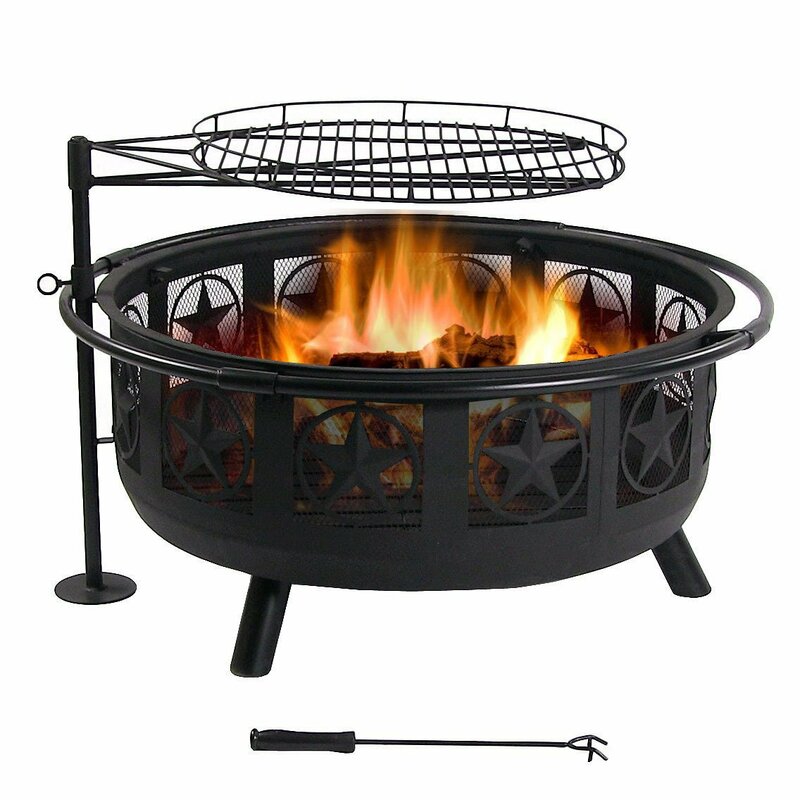 This fire pit grate is made from durable steel with high-temperature heat resistant paint finish. Comes in lots of sizes. Not recommend to place food directly. Backed by 1-year manufacturer’s warranty. This grate is forged from durable steel with high-temperature heat resistant paint finish. 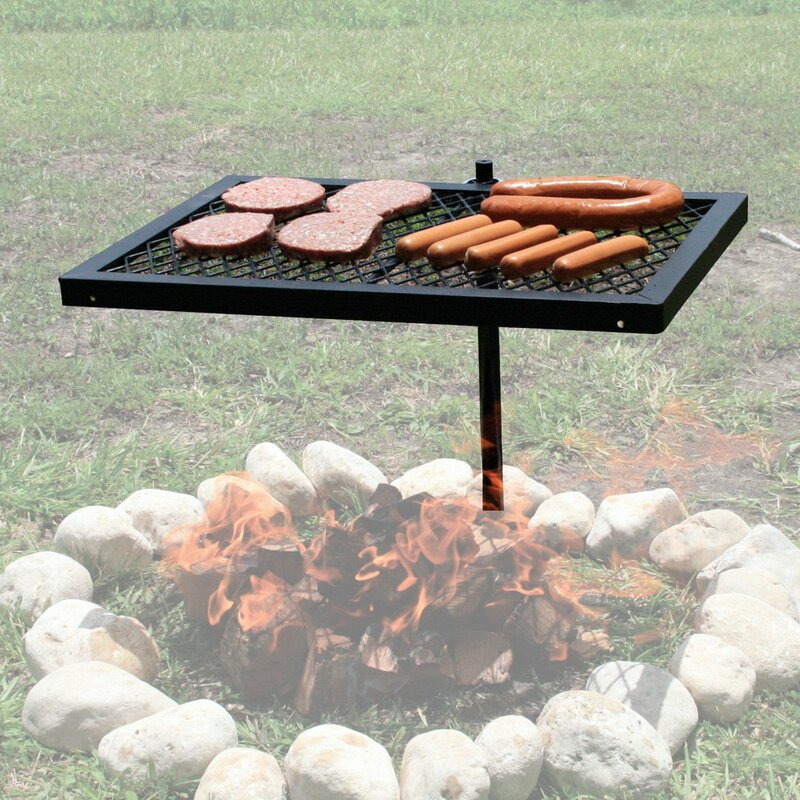 With this one, you can place food directly on it for grilling over the flames. Features solid steel handles for easy lift off. You can also attach it easily to a tripod for easy cooking over a fire pit or campfire. 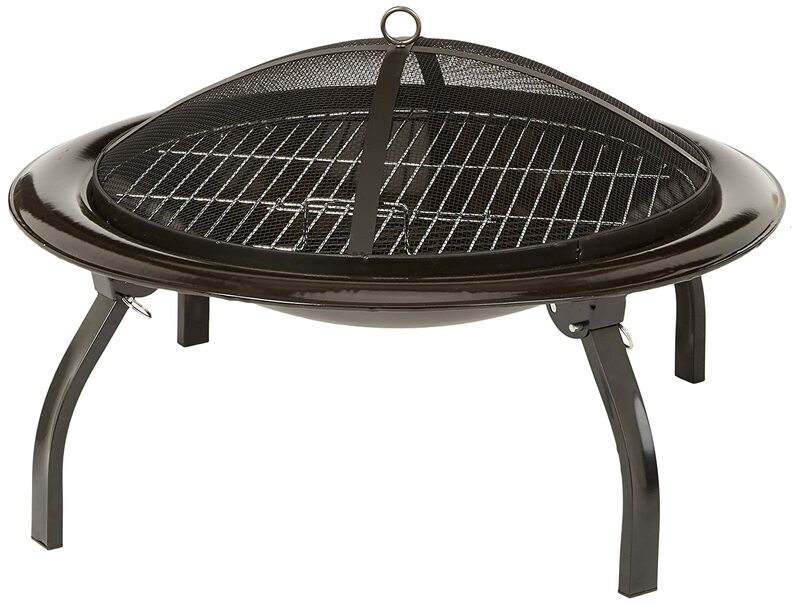 If you have a permanent, custom made wood burning fire pit, then this cooking grill grate would be an ideal solution if want to cook over your fire pit. 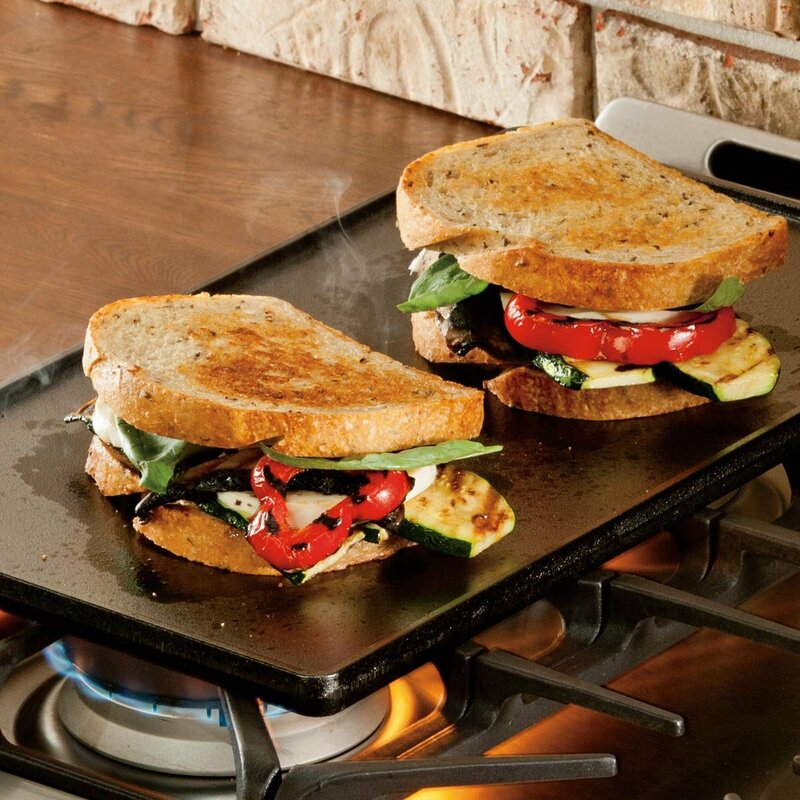 It folds 3/4 of the way to allow access to the fire underneath leaving your food on the grate intact. Fire pit is constructed from steel and finished with rustic patina high temperature paint for long-lasting durability and quality. Other than cooking grates, it includes a spark screen for containing embers, wood grate and a poker which also doubles up as a lifting tool. 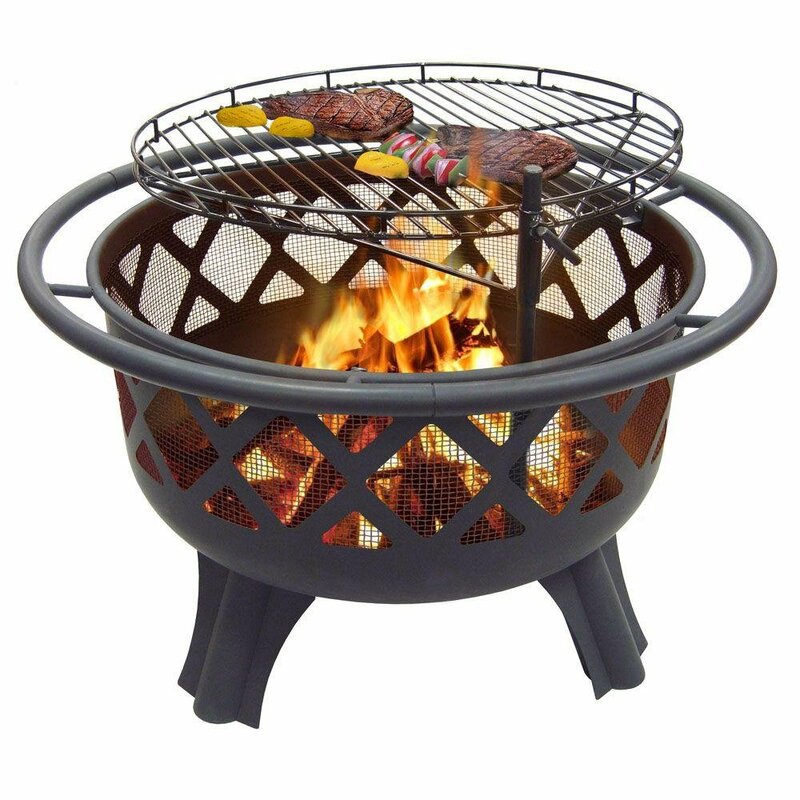 Firebowl measures 24 inch diameter x 10 inches high. Legs are 5 inches tall. 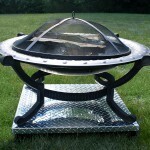 This fire pit is one of the most popular wood burning fire pits for camping and tailgating on the go. 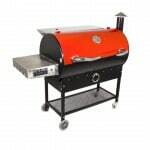 It features a heat resistant painted steel frame for style and durability. Also features a folding legs design for compact and easy portability and storage. Comes with a cooking grate , a safety screen and poker. Available in 29 inches and 22 inches. 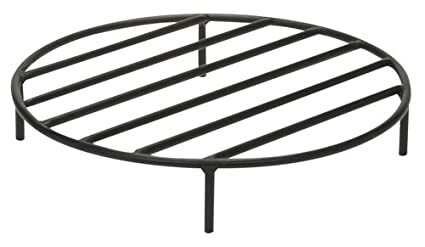 Clevr fire pit is constructed from sturdy steel with heat-resistant and rust-resistant powder-coated finish. Features wild animal cutouts on the flame. 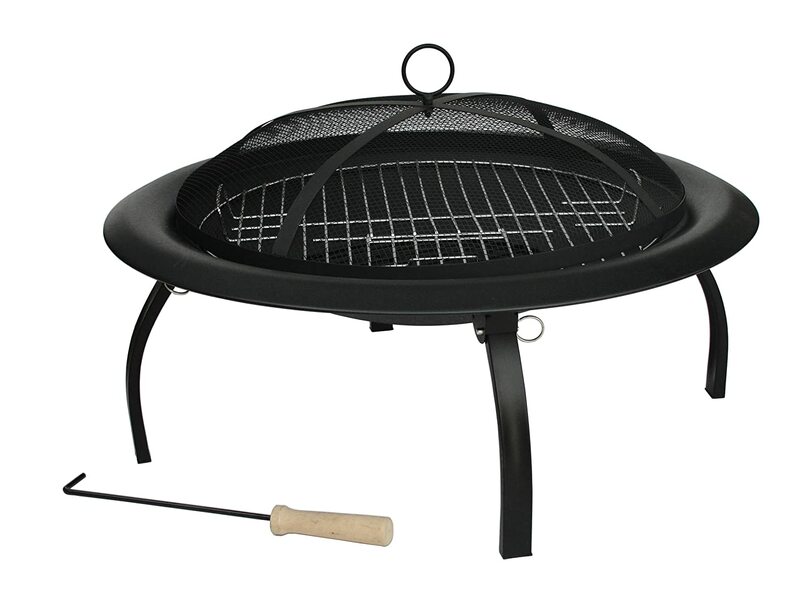 Comes complete with a safety mesh spark screen, poker, full-size cooking grate and a full-diameter handle for easy portability. Suitable for camping, tailgating and outdoor cooking on the go. 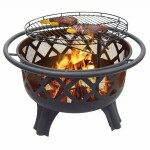 This heat-resistant painted-steel portable fire pit comes with two removable grates, a log grate and a cooking grate. Legs that fold compactly for convenient storage and portability. These are the the most common fire pit accessories used for cooking. Grills allow you to place your food directly on them and cook over an open flame. 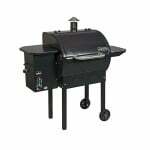 Fire pit grills come in various shapes and sizes, some more functional than others. 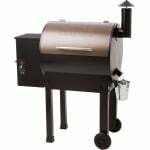 For example swivel grills and adjustable grills offer more functionality and convenience by allowing you to move your food closer or far away from the flames as you please. 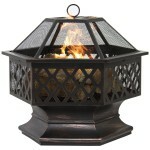 This heavy duty steel fire pit features a large deep fire bowl with cutouts and mesh screen. 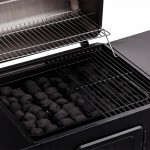 Aside from the cooking grill, it also includes a mesh spark screen and poker for safety and convenience. Also features a safety ring for easy transport. 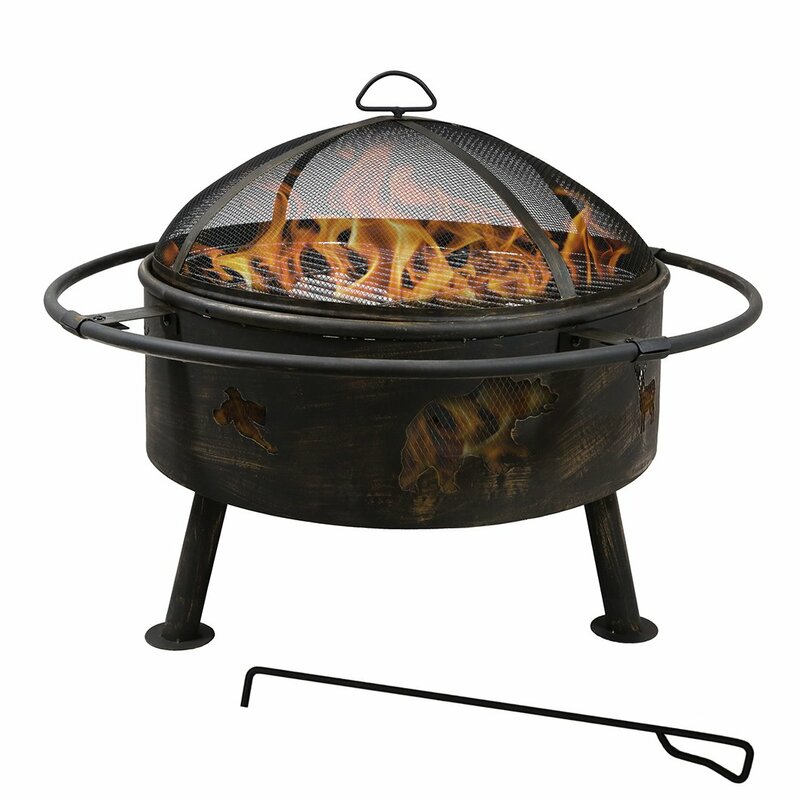 This fire pit is constructed with heavy duty steel with high-temperature heat resistant paint finish. Comes with a 22″ adjustable, 360-degree swiveling cooking grate with 1.5 inch lip to prevent food from falling off while cooking. 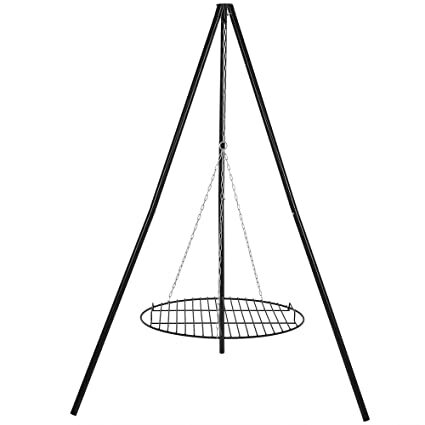 The support pole for the cooking grate easily attaches to the side of the fire pit bowl. 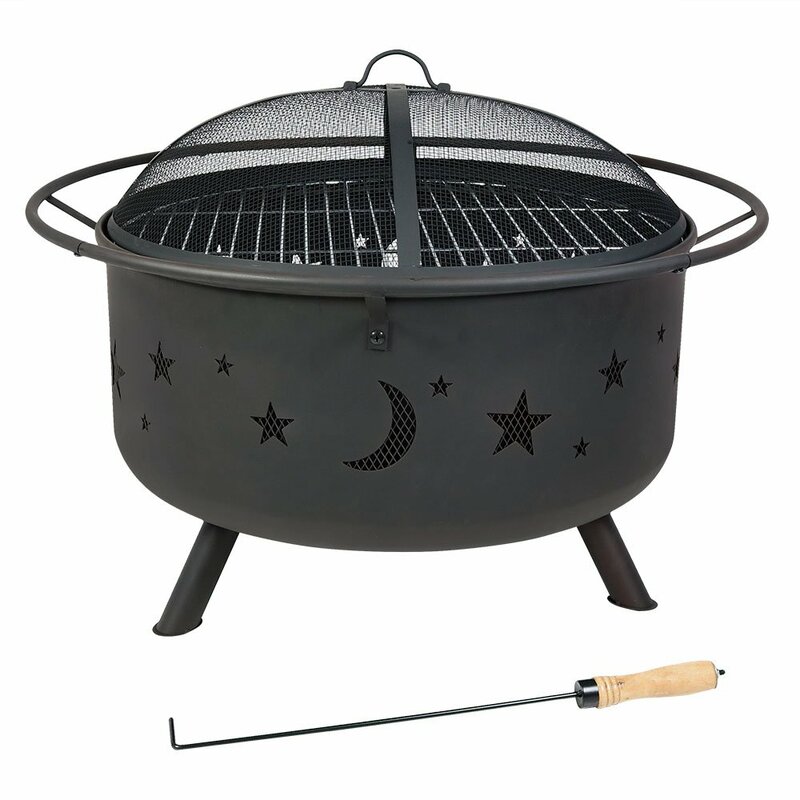 Fire pit also includes a spark screen with handle, poker and a wood grate. We’ve all used roasting sticks at one time all another because how else were you going to roast marshmallows and hot dogs over a campfire? Roasting sticks allow you to easily roast your hot dogs and marshmallows while still maintaining a safe distance from the fire. 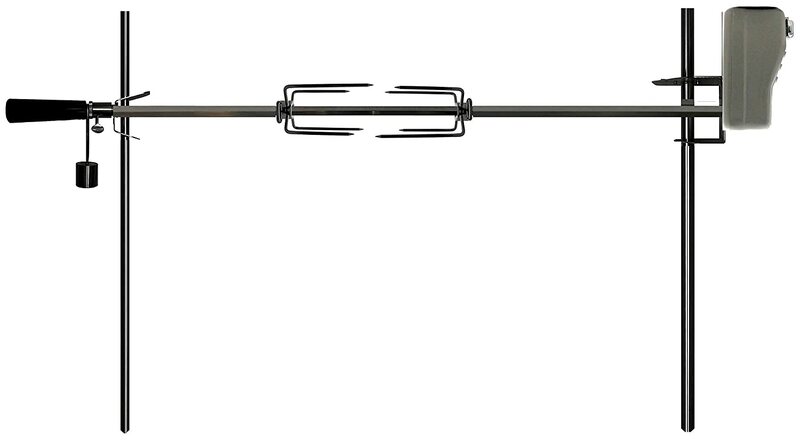 Rotisserie, the popular style of roasting used in ovens or campfires to roast entire animals, such as pigs, chickens or turkeys where meat is pinned and held on a long solid rod called a spit as it is being cooked over through continuous rotation. You can use the same same rotisseries to cook large pieces of meat over a fire pit just as easily. Griddles are great for cooking steaks, sausages, flapjacks, eggs etc. 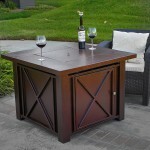 There are lots of sizes and designs to chose from and are constructed from materials such as steel and cast iron. Cooking griddles are generally durable so if you buy one you can expect it to last for years. For convenience, place your cooking griddle on top of your fire pit grate and you will be ready to enjoy a home cooked meal cooked over a fire pit. Tripod stands, are great for holding dutch ovens, coffee pots and tea pots cooking over a campfire, but you can also use them over your fire pit without any problem. They feature 3 sturdy legs for stability with a metal chain and hook hanging at the center on which dutch ovens, coffee pots and tea pots are hanged. Most tripod stands are made of heavy duty steel. By now you can see that some of the the same cooking accessories used with a campfire can just as well be used to cook on a fire pit. Of course there are more accessories from dutch oven to cast iron skillets, the above list is not exhaustive. At the very least I have been able to shed some light on how to cook on a fire pit. Do you have any related questions or comments? Feel free to use the comment section below. 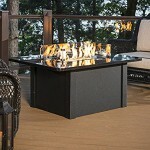 Fire pits are great i like that you can sit around them with family and friends or cook on them such a good product. I don’t have one myself but I’ve always wanted one but was never to sure about the type i would buy. This is a great site for people like me who have no experience or knowledge on fire pits and accessories, now all i need to do is decide on one. Feel free to ask any questions you may get when you decide to get yourself a fire pit! Thanks for the very informative post about cooking over a fire-pit. It seems like the things you use over a campfire work well with the fire-pit as well. I especially like the tripod stand! 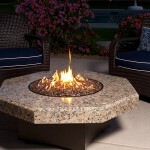 As a dedicated pyro-philiac, I have been drooling over the assorted fire-pit designs and such. Factoring in the cooking possibilities will probably fuel even more debating. It’s all good fun…thank you!